With so many places to log in to on the web these days sometimes we forget our credentials. Credentials are the information we need to access secure areas on the Internet. That may be an e-commerce site like Amazon or social media such as Facebook. Credentials often include a User Name and Password. But they may include other information such as "secret questions" that are used to verify a persons identity when they need to change a password or can't remember the password. 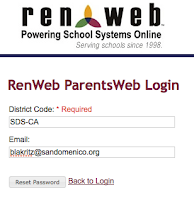 San Domenico families and staff use RenWeb to view student information. If you need to reset your password for any reason here are a few easy steps to take in order to update your log in credentials on your own. 1. Open the RenWeb home page: http://www.renweb.com. 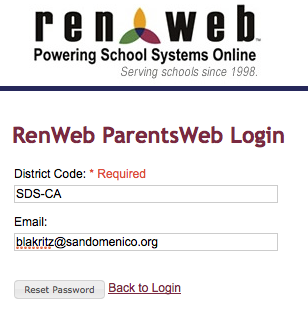 Mouse over the "Logins" button and click the ParentsWeb Login option. 2. In the upper left hand corner of the screen you will see the credentials log in fields. Click the "Forgot User Name/Password?" link in the middle of the log in area. 3. Enter the District Code and your E-mail address and click the "Reset Password" button. 4. 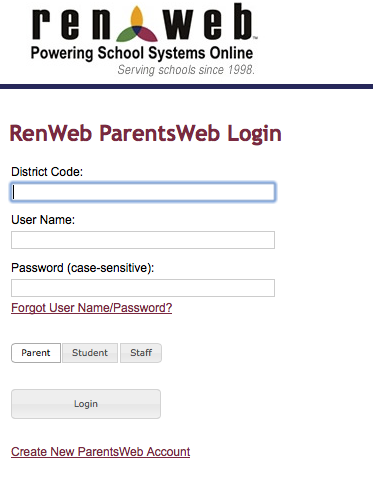 This will generate an E-mail message with a link to a password reset page on the RenWeb site. 5. Click the link in the E-mail. This will take you to a password reset page. Enter a new password and confirm the new password in the two available fields. Click the "Save user Name and/or Password" button to complete the process. 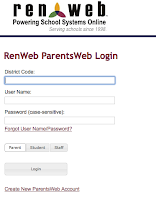 Once you complete the process the RenWeb site will confirm that your password was reset. Many of our students are accessing cloud services as part our educational program. These sites include our San Domenico Moodle learning management system, Turnitin.com, GMail, and Box. Each of these sites offer similar methods for changing and updating your password and log in credentials. Please note that using secure passwords are an important part of computing and communicating online. Regular updates to your passwords are a good way to keep yourself and your data and identity secure. We encourage you to be vigilant with this information and not share it with anyone, even close friends. Please let us know if you have any questions or need any assistance with this process. You can always reach us via the San Domenico HelpDesk E-mail.